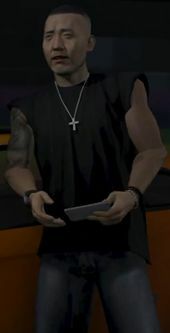 Hao is a character in the HD Universe who appears as a Strangers and Freaks character in Grand Theft Auto V. He is voiced by Rob Yang. Hao is, in 2013, a Chinese-American owner and mechanic of the Los Santos Customs garage in Los Santos International Airport and a friend of both Franklin Clinton and Lamar Davis. He helps the protagonist of GTA Online by delivering a car for their race with Lamar Davis and later repairs Amanda De Santa's red Sentinel for Franklin. Hao also informs Franklin of various illegal street races throughout Los Santos and sends an e-mail congratulating Franklin after he purchases a Los Santos Customs garage in Blaine County, saying that he will have to give Franklin free modifications now that has bought into the franchise. This page was last modified on 10 January 2014, at 18:56.